Integrated Batteries India Pvt. Ltd also Known as IB Solar are leading manufacturer, developer, Supplier and Exporter of Solar Street Light. 1. Significant cost savings in avoiding to lay down electrical wires, distribution points, employing labor and doing away with digging hassles. 6. Environment friendly and easy disposal due to absence of harmful substances like mercury and lead. 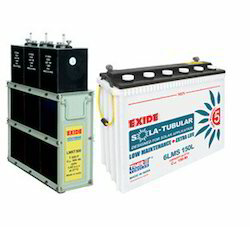 IB Solar are authorised distributor for Exide range of Solar Tubular Batteries. Integrated Batteries India Pvt. Ltd are leading manufacturer, developer, Supplier and Exporter of Solar Power Plant. Price range start from 10,000 to 10 Crore. Integrated Batteries India Pvt. has developed a range of standard PV Systems for on-grid and off-grid applications. The components are best chosen to ensure reaching the highest qualitative performance of the system with very stringent quality checks. Additional to our standard portfolio, our team of experienced engineers can develop PV systems based upon your specific requirements both for on-grid and off-grid applications either roof-top or free-field installations. IB Solar is approved MNRE channel partner for setting up Solar Power plants in Rooftop and Ground mounted in any capacities. Being Modules manufacturer, the heart of Solar Power plants we have got advantage of price and assurance of quality. Integrated Batteries India Pvt.Ltd also Known asIB Solar are leading manufacturer, developer, Supplier and Exporter of Rooftop Solar Plant. Off-grid and Decentralized Solar Power Plant or solar energy systems convert sunlight into electricity without connecting to local utility grids. They are ideal for areas without public grid access. In some cases, off-grid solar energy systems include storage solutions such as batteries or flywheel energy storage, which allow excess electricity to be saved for future use. The main components of off-grid systems include solar panels, con-inverters, and batteries. utility grids, such as a remote islands and mountainous regions. In these cases, off-grid solar energy systems replace conventional power generation solutions such as a diesel generators. There are a few key differences between the equipment needed for grid-tied, off-grid and hybrid solar systems. IB Solar has developed a range of standard PV Systems for on-grid and off-grid applications. The components are best chosen to ensure reaching the highest qualitative performance of the system with very stringent quality checks. Additional to our standard portfolio, our team of experienced engineers can develop PV systems based upon your specific requirements both for on-grid and off-grid applications either roof-top or free-field installations.